Finding the motivation to work out can be bad enough. But when your exercise routine also takes a dig at your wallet, suddenly the world seems a little less fair. There aren’t too many corners worth cutting. You shouldn’t sign up for sessions with a trainer who isn’t certified just to save a few bucks, just like you shouldn’t skimp on a good pair of sneaks. But here are a few things you can definitely spend less on — and get your focus back to where it belongs. If you’re a regular gym-goer, you’re probably getting your money’s worth. But, between outdoor runs, trying new workout classes with friends and your home library of fitness DVDs, your gym attendance can dwindle even as you continue to exercise regularly. It’s a smart idea to calculate how much you’re “spending” per visit to the gym. The average monthly gym membership costs $58, according to Statistic Brain. If you go three times a week, each sweat session averages out to under $5. But go three times a month and each visit costs closer to $20. It’s not often that you’re forced to evaluate the worth of each visit in such concrete terms. After all, you’re probably not paying in cash every time you go. But a few minutes of number crunching can help you realize it’s time to cancel your plan, or at least ask gym management to freeze it during extended periods of time when you use it less to save you some cash. Even if you are using your membership regularly, there may be some ways to cut back on the cost: Ask your friendly HR rep if your employer or health insurance plan offers any discounts you’re not already making the most of. Check with your gym if there’s a better rate if you pay for the entire year up front. Or mention to them you noticed a great deal at their competitor across town — they may just honor that deal to keep your business. 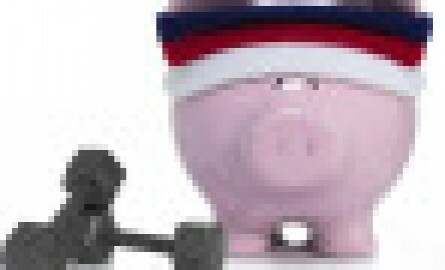 Get more easy ways to save money on your gym membership here. A couple of bucks for a neon-colored drink can add up fast, depending on how often you sip (especially when you compare it to tap water, which is, hello, free). The truth is: Unless you’re exercising — hard — for more than an hour, that water is all you’ll need. Despite what you’ve probably heard about replacing the fluids you lose during a workout, you won’t actually deplete your body’s stores of essential electrolytes or energy until at least 60 minutes of intense activity have ticked off the clock. Even endurance athletes, who likely do need to drink (or eat!) during exercise, can save money on the right replenishing balance of sugars and salts. Try mixing up a homemade sports drink (which also means more natural and fewer artificial ingredients) or opting for a solid food that can work the same magic, like a banana, which never costs more than $1. Almost every exerciser can recall the moment when he or she finally ditched the cotton T-shirt. And in many ways, a technical shirt — the kind made with wicking ability to keep you dry(ish) — can make all the difference (humidity, we’re looking at you). But almost every exerciser can also tell you the things stink, apparently, according to a new study, because odor-causing bacteria seem to grow more easily on polyester than on cotton. In an odd catch-22, the higher the quality (i.e. price) of your technical shirt, the less rancid it’s apt to smell, Runner’s World reported. By loading up on mid-level running shirts only to have to toss them after a couple of wears and washes, you may end up spending more than you would if you carefully selected a couple of top-level pieces. How do you save money on your workouts? Let us know in the comments below! Follow HuffPost Healthy Living’s board Fix Your Form on Pinterest.